Do you have a question for us? Please get in touch! Often people ask us if we are “Organic” or “Certified Organic”. No. We are not Certified Organic. There are many farmers that do not use pesticides, herbicides or genetic modification (GM or GMOs) in their farming that are not Certified Organic. Our main objective is to produce healthy, naturally reared animals and support local producers (both Certified Organic and non-Certified Organic) when we purchase feed grains and hay. We aim to source non-chemically treated ingredients from neighbours and friends regardless of their certification status. Where we can, we seek to source grains from farmer’s that are practicing and experimenting with regenerative farming practices. Certification can be prohibitive and is not necessarily a good indicator of how sustainable, forward thinking and regenerative a farm is. We realize that people want to eat food that is not treated with synthetic chemicals or affected by genetic modification (as opposed to hybridization). We are a small family farm and we feel the same way about our food. We want to produce food that is good for your health and the health of your family. We want to produce food that is good for soil health and the environment. We use a systems ecology approach, Holistic Management and planned grazing on pasture to produce food that takes more than certification into consideration. Our animals spend their lives outside on pasture. The land that we steward has been in pasture for many years and our pastures and hay have not been chemically fertilized or sprayed with herbicides or pesticides. Our animals are raised without the use of synthetic growth hormones, antibiotics or GM feed grains. You are welcome to come and visit the farm. As part of building a food community we ask you to be the judge. What is the difference between pasture-raised and grass-fed? Grass-fed refers to what an animal eats (grass) and pasture-raised refers to where an animal eats (on a pasture). Most grass-fed animals are pasture-raised but not all pasture-raised animals are grass-fed. We have, in the past, been asked about grass-fed chicken. 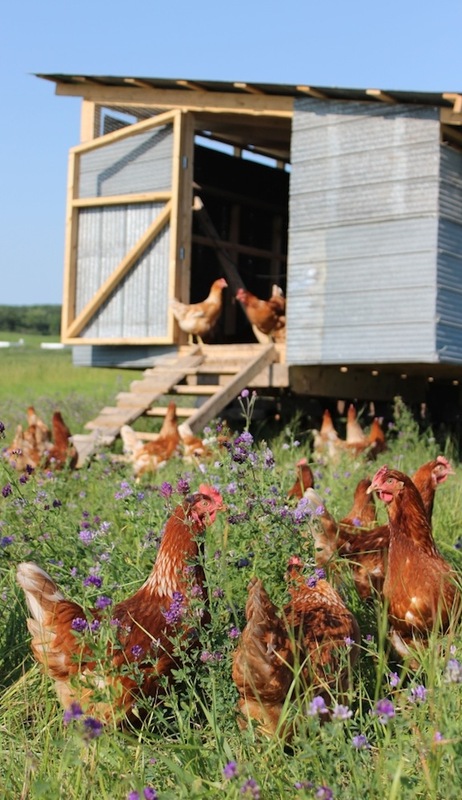 Our chickens are pasture-raised and not grass-fed. Chickens and pigs are opportunistic monogastrics (single chambered stomach). They will eat a variety of foods (including a little bit of grass) but do not digest cellulose like a ruminant (cows, sheep, goats) and do require supplemental feed (grain). Pastured animals live on pasture but are not necessarily grass-fed. Grass-fed refers to a ruminant that eats its natural diet of forage/grasses. There are various types of grasses that are used for feeding and finishing grass-fed animals. Both perennial and annual grasses, including many cereal grasses are used. In a grass feeding system, these crops are fed before the flowering stage (as green grass with no grain). Over the winter months grassfed animals are fed a mix of hay (dry grasses) or greenfeed (hay made from annual cereal crops before they form any starch). On the farm we raise grass-fed lamb and beef and pasture raised poultry and pork. The terms “grass-fed”, “grass-fed & finished” or “grass-finished” can often be confusing. In the case of beef cattle, all beef cows eat grass at some time in their lives. “grass-fed” most commonly refers to cattle that have lived out their life on pasture and eat grass from the time they are born until the time they go to slaughter. “Grass-finished” generally refers to an animal that was at some point fed grain but was placed on a 100% grass diet for the last several months of it’s life. There are no standards governing the use of the term “grassfed” in Canada (and in the US “grassfed” can be raised in a feedlot as long as they do not eat grain) so it is important for you to know where your food comes from. If you know the farmer you can ask questions and see for yourself how the land is managed. We welcome folks to come and see our grazing methods so that you can decide for yourself what food is best for your family. Do you raise all of your own animals? Yes. All of the meat we sell comes from animals raised here at Luna Field Farm. This is very important to us! This is one reason that we often sell out of items like pasture raised chicken or eggs. We produce everything here on the farm and when we sell out we do not simply try to “source” more product. This oversight is important is it is up to us to make sure the animals are raised in a way that we feel good about. Our grassfed beef operation is a joint effort. We manage our cattle together with our neighbour Iain. We own a portion of the herd and the cattle graze over a couple thousand acres. We live on neighbouring farms and our land borders each others. We work together and the grassfed beef portion of our farm is a joint effort that we are all very passionate about. Jo Robinson, author of “Eating on the Wild Side” provides a wealth of information on the topic on her website Eatwild which was founded more than 10 years ago. It’s mission is to promote the benefits—to consumers, farmers, animals, and the planet—of choosing meat, eggs, and dairy products from 100% grass-fed animals or other non-ruminant animals fed their natural diets. Check out www.eatwild.com for great information on the health and environmental benefits of grassfed! How do we order food from Luna Field Farm? If you would like to order please get in touch with us! We would be happy to add you to our mailing list. We send out regular farm updates and ordering information. Because our production is seasonal and some items are not available all year (chicken for example) we like to let you know what is happening on the farm and what food is available for order. You can also head over to our order form. Once you submit your order we will get in touch with you regarding delivery dates and locations. If you have a busy schedule don’t sweat it! We do regular deliveries and we will provide you with a few options for delivery dates and times. Absolutely! We want to work with you to make sure that you are happy with the food from our farm. We strive to produce a great product and provide all of the information you need to have a wonderful eating experience. If you are not completely satisfied with your purchase we will arrange a refund on all unused frozen product. We are thrilled that you are interested in Luna Field Farm! Please contact us with your questions!